The latvian graffiti artist KIWIE is going to run 5 exhibitions in the same time, in 5 countries and 5 different european locations. 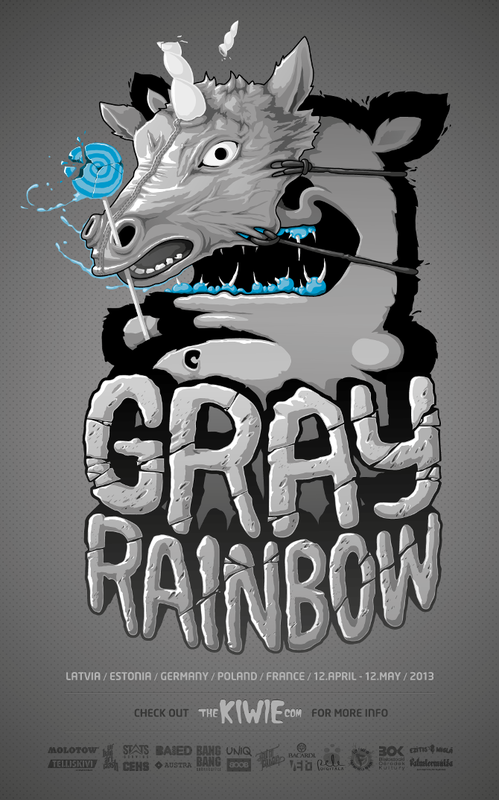 The international KIWIE Fat Monster exhibition titled GRAY RAINBOW will be up in Riga, Berlin, Tallinn, Bialystok and Paris from April 12th to may 12th, 2013. There is no meaning in the title of the exhibtion, just the ironic combination of words, the artist say. Find out more about this project and dates after the jump! In society there is this stereotype of graffiti as anegative art movement and mostly it goes under the word – vandalism. So one of the main goals of this exhibition is to show the graffiti positive side. With the right attitude, from simple graffiti tags it’s possible to evolve to complicated graphic designs and big mural walls. This project is held in 5 European cities at the same time (Riga, Berlin, Tallinn, Bialystok and Paris). This exhibition is going to be about graphic poster designs made by Kiwie. Together about 20 poster designs, printed on A1 size strong plastic material. Artwork combinations will be identical in all of the galleries.